"Cashman and (Kenny) Barron bring the listener to the edge of his seat through their thrilling adventures." " The true essence of Jazz as we know it today and how it derived is in this album." "you are a world-class player and teacher." "Standards and several originals comprise this Straight-Ahead quartet session led by tenor saxophonist Glenn Cashman. As Director of Jazz Studies for Cal State Fullerton in 1999-2001, he developed an appreciation for the high caliber of music heard on any night of the week around the Southland. Recent outings at Kikuya and The Jazz Bakery merely bind the connectors tighter. Cashman, who holds a Doctorate of Musical Arts in Composition, holds a respect for the balance that is required between Jazz education and Jazz performance. The session's six standards are interpreted with a natural ease. Providing stellar support for the saxophonist are pianist Kenny Barron, bassist Ray Drummond and drummer Ben Riley. Together, the four quartet members explore lyrical melodic patterns and lush harmonic arrays. Four originals highlight the leader's composing authority, which centers on dreamy chorded landscapes and lush lyricism. His major influences, no doubt, include Duke Ellington and Billy Strayhorn. The session remains Straight-Ahead throughout with an ethereal quality that pervades. If you're a quality freelance musician and you're going to record, it makes sense to hire the best available rhythm section. 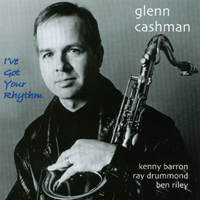 The stars were in alignment for tenor player Glenn Cashman when he did just that back in June 1996; the stars, in this case, were pianist Kenny Barron, bassist Ray Drummond and drummer Ben Riley. Cashman is a professor of jazz studies at upstate New York's Colgate University with strong academic credentials. This CD shows that he also has strong musical credentials, chops if you will, with a spirited and savvy tone and muscular approach to his music. The CD opens with the title track, a savvy Cashman variation on what the jazz community has come to call "rhythm changes" - chord changes from the Gershwin standard "I Got Rhythm." Jimmy Van Heusen's "It Could Happen To You" is an even stronger launching pad for Cashman & Co.'s exploration with an intensive sax solo setting up a rollicking Barron solo, which rides a mighty cushion provided by Drummond. Freddy Hubbard's timeless jazz anthem "Little Sunflower" is one composition that became a personal favorite the first time I heard it on a CTI project. I love it no less today. The melodic hook and the solo flights it inspires among its players have much to do with it. Cashman's version, with this fine rhythm section, doesn't disappoint. Nor does his romp through "Softly, as in a Morning Sunrise," though it hardly captures the delicate mood the title suggests. Their reading of John Coltrane's "Some Other Blues" is shaped by a splendid bass hook Drummond drew from a snippet of the opening melody. Cashman uses this as a showcase for his robust musical preferences--and the rhythm section is right with him. "Nevsky Prospekt," another Cashman original, is up-tempo. "Happy Camping" opens with a laid-back crystalline Barron solo that has you thinking ballad until it twists into its up-tempo true shape. Are we sensing a trend here? The guy loves to play with fire. Two jazz standards, Ellington's "In A Sentimental Mood" and "Autumn Leaves," close out this session in fine style. The former shines brightly on Drummond's artful and lyrical bass soloing. You read it right at the top. The studio date was in 1996. It took seven years for this recording to make it onto the streets--but many will find it was worth the wait. Let's hope the next one comes along a bit faster. Glenn Cashman established himself as a topnotch performer and educator in the Southern California jazz community before moving across the country to accept a great position at Colgate University in upstate New York in Fall 2001. His free wheeling compositional approach to improvisation has its roots in the playing styles of Joe Henderson, Wayne Shorter and John Coltrane. The Glenn Cashman Quartet appearances have been extremely well received and have garnered critical acclaim. The quartet features the first-class swinging guitar of Ron Eschete, premium bassist Luther Hughes, and the inventive and in-demand drumming of Paul Kreibich. The rhythm section toured for many years with pianist Gene Harris and can be heard on numerous recordings on the Concord label. Glenn returns to Southern California at least four times a year to perform. He released a solo saxophone CD entitled "I've Got Your Rhythm" on the Indigo label with jazz greats Kenny Barron, Ray Drummond and Ben Riley featuring several of his compositions. He has also performed with Dennis Chambers, Claudio Roditi, Gary Foster, Jeff Clayton, Kendall Kay, Paul Bollenback, Tom Ranier, Drew Gress, Jim Pugh, Jeff Littleton, George Colligan, Tony Martucci, The Central New York Jazz Orchestra, Rob McConnell, Gap Mangione, Hideaki Tokunaga, Steve Gadd, Jeff Jarvis and many others. Glenn has appeared in jazz club and concert venues in Russia, Sweden, Australia, on the East Coast and in Southern California. During most of the 1990s, Glenn was Director of Jazz Studies at Towson University (TU) in Baltimore having been selected to follow the great composer and educator Hank Levy. Glenn led the TU Jazz Ensemble to consecutive First-place finishes in the Villanova Jazz Festival. Both CDs he produced with the TU Jazz Ensemble were cited by the International Association of Jazz Educators as among the top campus ensemble CDs of 1999 & 1996 in Herb Wong's "Blue-Chip Awards." Glenn was Jazz Director at Cal State Fullerton from 1999-2001. Although he only lived in Southern California for two years, he planted some roots there that have grown deep. Glenn appears as a guest soloist, as part of the Ranier/Cashman duo with superlative LA pianist Tom Ranier, and with the Glenn Cashman Quartet. His conducting/clinic credits include the Southern California Band Director's Association Honor Jazz Band, Delaware All-State Jazz Ensemble, and International Association for Jazz Education Conference. In 1999, Glenn earned a Doctorate of Musical Arts in Composition from the University of Maryland, College Park. He is a founding member of “Luther Hughes & The Cannonball-Coltrane Project.” Glenn also collaborated on a duo recording with pianist Tom Ranier on Primrose Lane Music called “Blue In Green” and the two co-led a sextet CD entitled “Bright Idea.” Glenn’s latest CD release is his 14 piece “Glenn Cashman & the Southland Big Band” that has just been finished featuring top LA jazz and studio musicians performing 9 of his works and one Jobim composition.